A common result of auto accidents, falls, and having weak bones is the condition known as anterolisthesis. It refers to the positioning of the vertebra in the spine once it receives a blunt force or hit. Once it occurs, it may offer a range of painful symptoms that can range from mild to severe. We will study the condition itself and possible treatments available. To understand the anterolisthesis definition, we must break down the word itself. “Ante” is the Latin word for “front, ” and “listhesis” is Greek for “sliding down on a path that is slippery.” From this, we have the condition of the upper vertebra slipping over in front of the lower vertebra, which can cause compression and pressure on the nerves and spinal cord. Anterolisthesis causes can also have a link to other incidents than just a fall or blunt force. First, we will explain the spine anatomy, as the cause can sometimes be associated directly with its structure. The spine consists of hollow vertebrae arranged on top of each other in a column along the back. They form what is known as the spinal canal or spinal column that surrounds the spinal cord, which is a structure of nerve tissue and cells. The vertebrae themselves stabilize the spine while allowing movements such as bending and twisting. When one vertebra moves out of line too far, it can have devastating and painful results. The vertebrae themselves stabilize the spine while allowing movements such as bending and twisting. When one vertebra moves out of line too far, it can have devastating and painful results. Anterolisthesis is a result of the forward movement of the vertebra at the upper portion of the spine, which causes pressure on the spinal cord and nerves extending from the damaged vertebra. As a result, other it can affect other parts of the body. These are the six main causes of anterolisthesis. Aging is a major cause of anterolisthesis, as the cartilage between the vertebra sections weakens and thins over time with use. 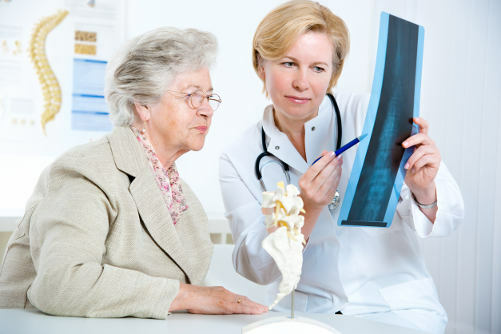 Consequently, it is common for elderly patients to have a vertebra slip out of original position. Any form of trauma or injury to the back can force a vertebra out of position. Anterolisthesis can result from falling on your back. Some cases of anterolisthesis have an association with a defect in the growth of the spine during development. This condition is seen in young children as they grow. This joint disease is often associated with back issues of the spine and can lead to anterolisthesis. In addition to the wear and tear we see on the spine with the aging process, there can also be a link to this condition with overworking the body. Bodybuilders and weightlifters can develop anterolisthesis. A tumor or growth on the spine can force the vertebra to move from its position. Due to the sensitivity of the condition, the most abrupt and first sign of the anterolisthesis symptoms is pain. The intensity and location of the pain are highly dependent on where the slippage and pressure of the vertebrae is. It can also dictate issues with the extremities if a connected nerve is involved. For example, if there is a direct link with the compressed nerve of the affected vertebra to the abdomen, the bladder and bowel can be compromised. Your doctor will do a complete physical examination accompanied by a symptom checklist to confirm an anterolisthesis diagnosis. If your medical practitioner finds signs that point to anterolisthesis, the spine may be closely examined with the use of imaging tests such as x-rays to confirm bone defects. A computerized tomography scan or a magnetic resonance imaging test will show any injury and the level of nerve damage. Although it is a rare situation, there are cases with 100% slippage where the vertebra completely slipped off the one below it. Each grade of slippage requires its own specialized anterolisthesis treatment plan. Conditions of the first two grades have mild symptoms, and the treatment targets alleviating those symptoms. A more severe condition may require surgery. Your doctor will recommend bed rest to help heal mild cases of anterolisthesis. During this time, exercises are done to maintain mobility of the spine and spinal cord. Activities are limited to avoid further slippage or damage to the vertebrae. More severe cases will require a hospital stay. The use of support pillows or a back brace may help the healing process. Bed rest and exercises may alleviate some of the pain symptoms. Other cases may require the use of medicinal pain relief with non-steroidal anti-inflammatory drugs that may be prescribed or purchased as over-the-counter pills. Steroids and opioids may be required. Treatment may extend to include physical therapy and possibly chiropractic treatment to ease complicated symptoms. Exercises done with a physical therapist address the symptoms and improve back muscle strength. Chiropractic treatment may move the vertebra into its original position. Cases of anterolisthesis that have gone beyond the treatment stages may need surgery. As a last resort, it may be necessary to adjust the vertebrae or support the spine with internal fixation like metal plates, wires, rods, or screws depending on the state of the spine and vertebra. Anterolisthesis can be a complex condition depending on the severity of the damage to the vertebrae. Since the vertebrae move out of position within the spine, the attached nerves could affect various areas of the body, such as the legs or the arms. A sudden fall or even constant strenuous exercising can cause the vertebrae to slip out of place. Each case is graded based on a slippage percentage and treatment can be adjusted to the severity of the condition. Treatment may be as simple as bed rest with exercise, or it can escalate to surgery. “Anterolisthesis,” Health Information, October 21, 2011; https://www.hxbenefit.com/anterolisthesis-symptoms-causes-and-treatment.html, last accessed May 11, 2017. “Anterolisthesis,” Health Fixit, April 9, 2017; http://healthfixit.com/anterolisthesis/, last accessed May 11, 2017. “Anterolisthesis,” Hi Patient, January 14, 2017; https://hipatient.com/anterolisthesis, last accessed May 11, 2017. “Anterolisthesis-Grading, Symptoms, Treatment, Causes, Diagnosis,” Bye Bye Doctor; http://byebyedoctor.com/anterolisthesis/, last accessed May 11, 2017.